Moray base will feel the worst effect of military budget cuts in Scotland. RAF Kinloss, the home of the Nimrod fleet, is to bear the brunt of defence spending cuts north of the border. Defence Secretary Bob Ainsworth told the House of Commons that Nimrod MR2 aircraft would be withdrawn from the base 12 months earlier than was originally planned. Meanwhile, he said the introduction of the Nimrod MRA4 would also be slowed for financial reasons. However, all three of the large RAF bases in Scotland - at Kinloss, Leuchars and Lossiemouth - will remain open. 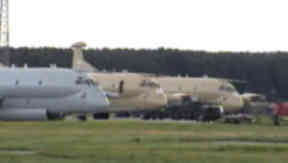 Speculation remains that parts of the Kinloss base could be put in effective cold storage, with the ageing Nimrod fleet due to be replaced in 2011. The MoD say there will be no redundancies amongst civilian staff, while military personnel will be "redeployed" elsewhere in the UK. In a statement, the MoD said: "The new Nimrod MRA4 will still start to arrive at RAF Kinloss in February 2010. "RAF crew and support staff will train on the aircraft but there will be reduced flying hours, so the in-service date will be delayed to about Autumn 2012. "Crews at Kinloss will continue to train on the new aircraft and the new simulators up there, thus retaining capabilities, skills and support staff. "By reducing the flying hours the RAF can make significant cost savings in fuel, servicing, maintenance, support services etc. "There are about 1800 RAF personnel at RAF Kinloss, 300 civilians and 300 contractors. The service posts are not indigenous jobs as RAF staff are posted there for 2 years in general. So any surplus RAF staff will probably be redeployed elsewhere in the UK. "There will also be some civilian staff reductions but it's hoped these will be natural reductions, not redundancies. The UK aeronautical rescue centre is not affected by this announcement." Both Kinloss and Lossiemouth are responsible for pumping tens of millions of pounds into the Moray economy, while hundreds of local jobs depend on the RAF's presence in the area. RAF Leuchars in Fife is due to welcome a squadron of the new Typhoon Euro fighters next year, and currently houses Tornados. The cuts are being made to help supply new equipment in Afghanistan including 22 new Chinook helicopters. Earlier this week the Government announced £150million would be spent tackling improvised explosive devices in the country. Meanwhile, the first of 500 extra UK troops have began arriving there.